Beaver Island, High Island and Garden Island are wonderful areas to explore by kayak. 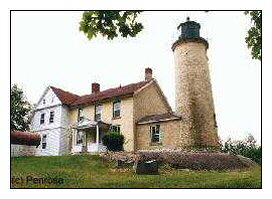 The largest, Beaver Island, has beautiful sandy beaches and two historic lighthouses. Much of the island is private land, there are large tracts of state lands to explore. The island has 350 year-round residents. High Island and Garden Island have very little privately owned land and provide a true wilderness camping experiece. The smaller islands have abundant wildlife, including a large population of harmless water snakes, gulls and shore birds. Beaver Island is the largest island in Lake Michigan and part of the Beaver Island archipelago. The islands in the Beaver Island archipelago include, in rough order of size: Beaver Island, Garden Island, High Island, South Fox Island, Hog Island, North Fox Island, Gull Island, Whiskey Island, Squaw Island, Trout Island, Grape Island, Hat Island, Shoe Island, Pismire Island. Gull, Hat, Pismire, and Shoe Islands, which are part of the Beaver Island archipelago, form the Lake Michigan division of the Michigan Islands National Wildlife Refuge, and two of them are part of the Michigan Islands Wilderness Area. Beaver is thirteen miles long, three to six miles wide, and forms part of Charlevoix County, Michigan. It is mostly flat and sandy, with large forested tracts. Charlevoix County, Michigan. It is mostly flat and sandy, with large forested tracts. Beaver Island is served by two small airlines: Island Airways and Fresh Air Aviation. Island Airways' planes fly from Charlevoix to Welke Airport (6Y8), a privately owned public-access airport in Peaine Township; Fresh Air Aviation's plane flies from Charlevoix to the township-owned public airport (KSJX), on the west side of the island, also in Peaine Township. Beaver Island Boat Company runs a scheduled auto ferry service from Charlevoix during most of the year. Daily service is available from May through September, and the ferry is closed from January through March. Voyagers are advised to check the weather before boarding, as rough waves can cause "sea sickness" for many passengers. Visitors wishing to bring their own vehicles must make reservations in advance. Sorry, we have no listings for this island group at this time!